FROM THE 21ST SEPTEMBER I WILL BE AWAY UNTIL 6TH OCTOBER. 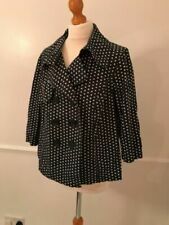 Beautiful size 18 Jaeger navy polka dot jacket in excellent condition. Boxy, cropped style. In slub effect linen, fully lined in acetate. SAXE BLUE WITH WHITE SPOT. TAILORED CUT WITH SMALL VENT IN THE CENTRE BACK. 2 FRONT PATCH POCKETS. 4 COVERED BUTTONS. 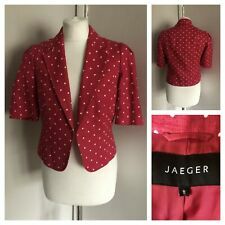 JAEGER Pink & White Polka Dot Cropped Jacket Blazer. Outer - 100% Linen. Length - Approx 19”. Cropped length with a peplum style frill at the hem. 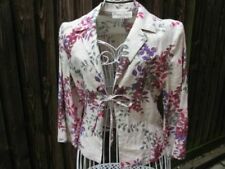 Striking occasion jacket from Marks & Spencer in a size UK 10. Linen blend fabric. 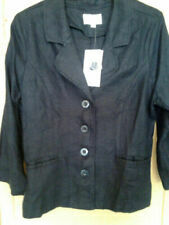 Single button fastening.